In this week's Travel Loot, our new column featuring the travel stuff we're currently crazy about, we pack up camping essentials. I've just written a story for Popupla about how I learned to love camping around New York City. I blame my friends, avid campgoers all, who make it easy and fun. Still, for as much camping experience as they collectively have, we somehow always manage to forget these essentials that often go overlooked. They seem superfluous with all the gear you've already packed, but they're worth investing in. Late-night conversations and philosophical discussions are much harder to enjoy when you're squatting on dirt. The ($49.95) is both sturdy and comfy. I don't care how effective it is, DEET is poison for the body. ($30) not only smells incredible, but is also DEET-, paraben- and sulfate-free. More importantly, it works. When the fire dies out, nights can be chilly. It's always better to be over-prepared than freezing and miserable. These hand-woven ($228) will keep you toasty. Bring a bunch, and nothing else. 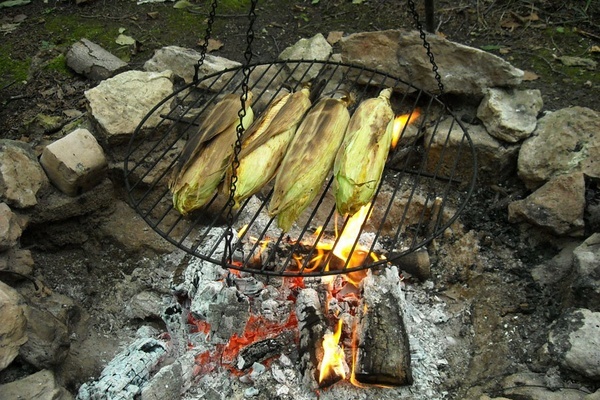 Once you've got a good fire going, simply place them on a log and let them roast for 5-10 minutes. Don't let them get too charred, and remove from heat. They turn out so sweet and juicy that salt and butter won't even cross your mind. If I could live off these, I would. is an anthropologist, writer, and yogi. You can follow her on Twitter at . She travels to expand the mind and to make new friends.